The Internet of Things: Coming to a Plaza Near You! Every now and then, I get blown away by retail and service providers that have seen the future of bricks-and-mortar and omni-channel, and have embraced the changes heading our way to an astounding degree. And you know what? I’m getting blown away more often. Go figure – the future is already here! It’s just not everywhere just yet. You’ve read my blog post on how Sephora’s winning at the omni-channel retail game. Today, I bring you how omni-channel is breaking into the service industry. And not just any service industry: the internet of things has come to a plaza near you! The story starts with my hunt for a new gym. Having experienced the ‘big box’ version of gyms in the past, I was pretty well informed on what I was looking for – and what I wasn’t. I didn’t want something huge and impersonal with sales reps and trainers prowling the gym floor trying to up sell me into services I don’t want. I wanted something close, something small, and something I could access on-demand based on my schedule and preferences. Something that fit my customer experience expectations! It already hit the marks in terms of the customer experience I was seeking out: it was local, it was 24-hours, it was boutique, the equipment was new and well-maintained, and the clientele it attracted were pretty cool people. And it was almost completely unstaffed. Pump the brakes. Did you catch that last point? I mean, did you really understand it? How can a 24-hour gym operate if there aren’t any staff on-site most of the time? 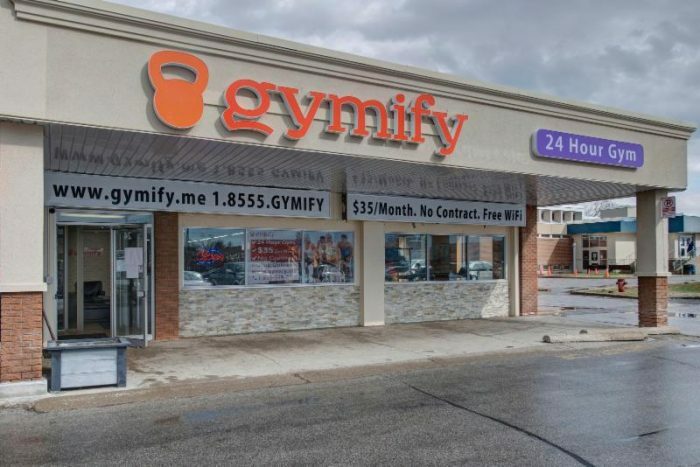 Well the short answer is an impressive use of data integration and a keen understanding of the internet of things, but let’s break my customer experience down a bit more to understand how Gymify has broken the typical gym mold to be something completely new and different. This was the interesting part. Staff are usually only on-site during standard working hours, which meant that when I was looking to do a tour and free trial, no one would be at the gym to let me in or show me around. So the first time I went to the gym, not understanding the complex mechanisms Gymify had already put in place, I just stood at the window with my hands cupped around my face in the spitting image of a sad outsider looking in. Looking back on that day now, I now understand how some seniors feel about any piece of smart tech these days: confused on how to work this thing! So I made a call to the hot line. I spoke to an actual person (proving a human touch is still important, even at a fully automated gym) who told me to call back when I was standing right outside the gym’s doors. So I did, and like magic, the door unlocked. Woo Hoo! Since the gym ended up being what I was looking for, I wanted to sign up the next day. This is where Gymify is different again, beyond the fancy magic lock on the door: I had to sign up online. There was no option to sit face-to-face with a sales rep who would try to talk me into more services I didn’t need, and a contract to boot. All I had to do to sign up for a membership was go online, submit my payment info in their ecommerce portal, and… that was it. I was automatically sent an email confirmation with instructions on how to access the gym before my key fob to unlock the door would come in the mail. And – now this is really cool – guess how I could access the gym for the interim period? I would enter some of my account information into a form on the Gymify website, hit submit, and the door would automatically unlock. Magic! Welcome to the future! I had just unlocked a locked door through an app on a website. Colour me impressed. What does the Internet of Things Mean for a Company’s Back End? Obviously, to have sophisticated Internet of Things functionality like Gymify (who also uses facial recognition technology, CCTV, and other technology to keep the facility safe and running properly), you need to have a sophisticated back end. And that’s likely simplifying the data flow and integrations behind my simple action of unlocking the gym doors via my smart phone. Gymify is just one example of a growing trend that we can expect to see more and more of as we truly become immersed in the age of the Internet of Things. If this example doesn’t stress the importance of proper data integration as we enter that age, I’m not sure what will. Gymify is clearly ahead of the curve in terms of their use of data. And as a result, their business is doing well: they are scheduled to open a second location soon. But without the sophisticated back-end integration of their applications, the concept would fall flat and Gymify would be just another gym. The message is clear: integrate your data and applications now and in a way that is sustainable and scalable, and you’ll be laughing all the way to the bank when the Internet of Things and omni-channel become the absolute minimum standard for successful businesses. Because you’ll have seen the future, and have prepared for it years in advance.